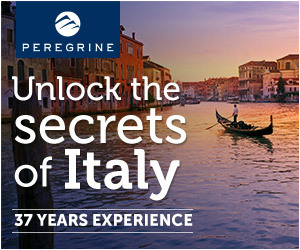 Polignano a Mare, Alberobello, Ostuni, Lecce, Otranto, Gallipoli, and more! 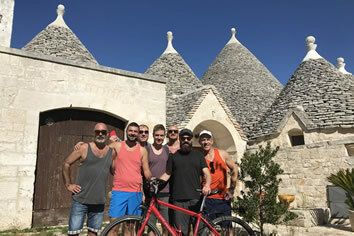 Join Italy Gay Travels on a cycle trip like no other! 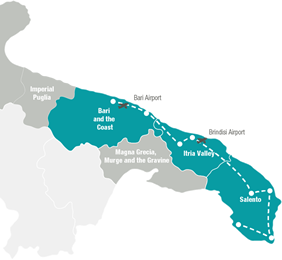 The Gay Cycling Tour takes you from the north to the south of this region, allowing you to discover many of the magical places in Puglia. 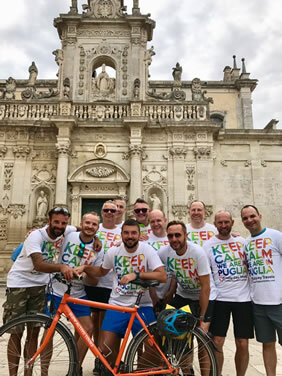 Puglia is fast becoming the gay destination of South Italy and that is why we are sure that the Gay Cycling Tour is perfect for you! The area is rich in culture, food, awe inspiring landscapes, white sandy beaches and some gay nightlife for good measure! • Enjoy stunning daily bike rides! Welcome to Poligano! Make your way to the hotel in Polignano a Mare. Explore this picturesque town suspended over the rocks before meeting in the evening. The Gay Cycling Tour commences over an aperitif dinner in the Old Town. Here you get to meet your fellow bikers and tour guides and discuss the journey that lies ahead. After breakfast we give our legs a bit of a rest and Transfer to Lecce by coach and take a tour of the city. Lecce is known as the Florence of the South and when you are rendered speechless by the baroque architecture you will know why. Next the Gay Cycle Tour heads to Otranto to discover the ‘East meets West’ architecture. Here we have dinner in a typical Masseria (Farmstead) where we will spend the evening. After breakfast feel free to do what you like the most! This is a Free from Bike Day. After breakfast it’s back on the bikes as we head to Gallipoli, an area with a few gay bars and beaches. We explore the Old Town and try out some of the local cuisine. En suite rooms in 3 and 4 star Hotels and B&B. This tour is accessible to anyone with a medium cycling ability. You should be comfortable on the bike and cycling on a road. There will be around 40 to 60 km (25 to 35 miles) a day so you need to be in relatively good cycling shape. 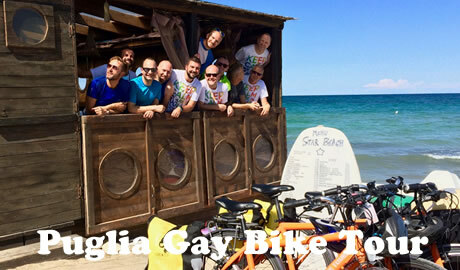 For a less strenuous experience try our Salento Italy Gay Bike Tour. There will be scheduled stops for visits and refreshments.